we’re not sure exactly how unblemished they need to be, but they do need to be picked from the tree and stored in bins with a close fitting lid. Then they keep for ages which will give us time to source the 200 lbs we need as a minimum for juicing. 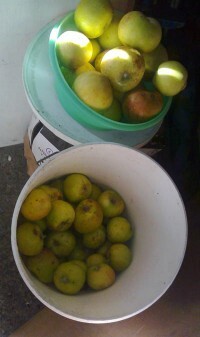 We did gather windfalls but they have started to bruise already, so have to be discarded. If we can locate another two or three good trees – where most of the fruit can be picked without a ladder – we may have enough to take this batch in, but will probably have to wait till next year now.